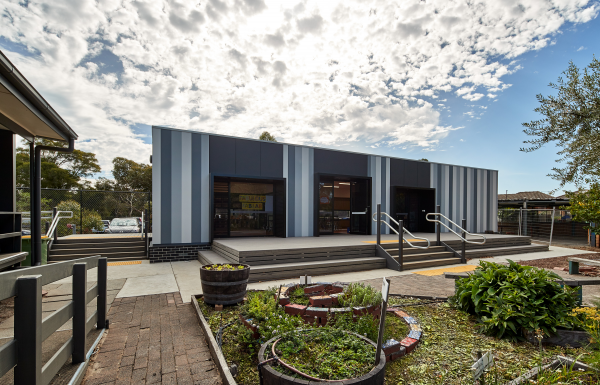 The Department of Education and Training (DET) have initiated a series of projects for modular school buildings to provide modern, comfortable learning spaces in Victorian Schools. 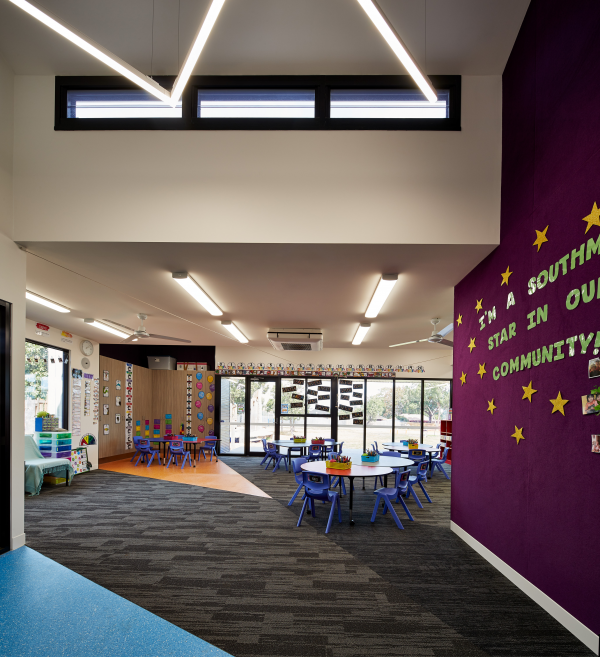 k20 Architecture was fortunate to team up with Grove Group to design and deliver Southmoor Primary School with an innovative, modern prefabricated school building. Southmoor Primary School required two prefabricated buildings to replace the outdated existing ones. The main building is the more traditional classroom suite with four classrooms and an office area for teachers. 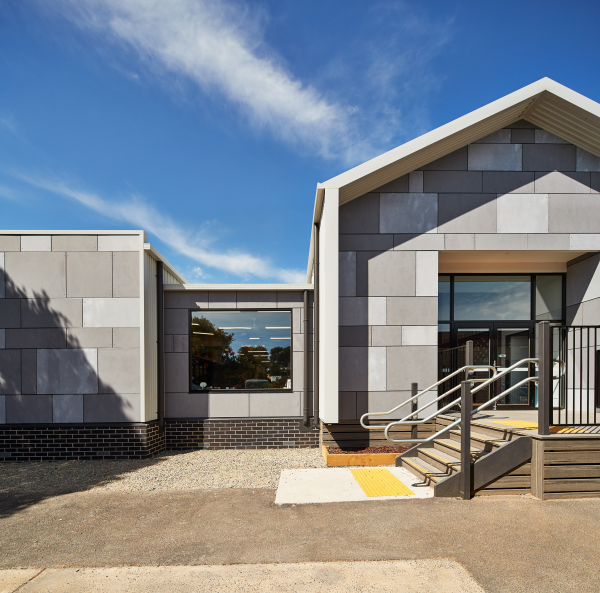 This building is very modular in its plan as the classrooms are mirrored across a central, large, light-filled corridor. 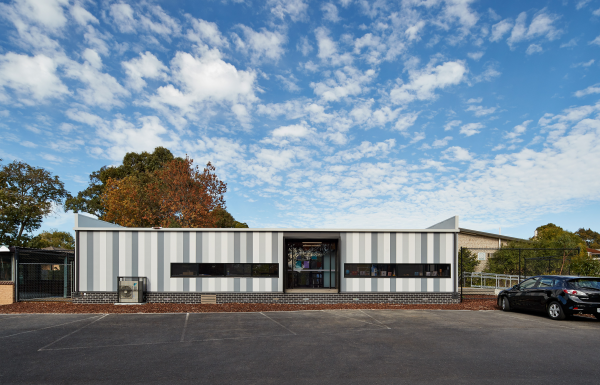 The second structure is the art room which was required to be an extremely flexible space so that its function could adapt. This project was on a very short timeline so part of the brief was to get it done quickly to minimise disruption to the school’s running. Prefabricated construction is truly an innovation that has responded to a need. 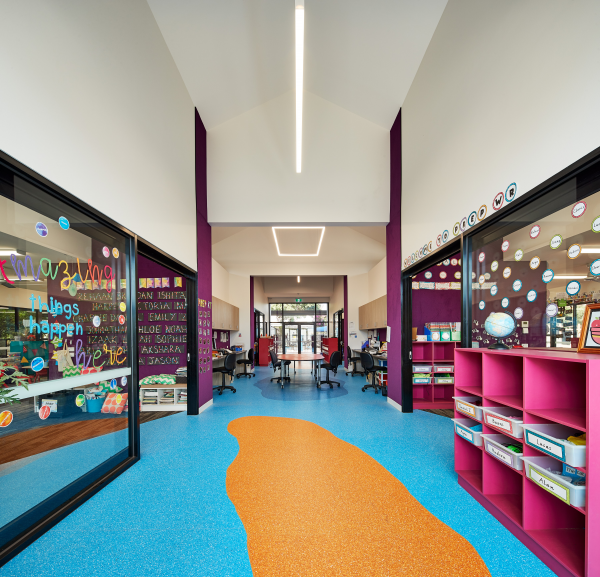 In this case, there is a strong demand for undisruptive construction in schools and k20 Architecture absolutely delivered on this for Southmoor Primary School. Construction on site lasted only three weeks and this occurred during the school holidays of January 2018. 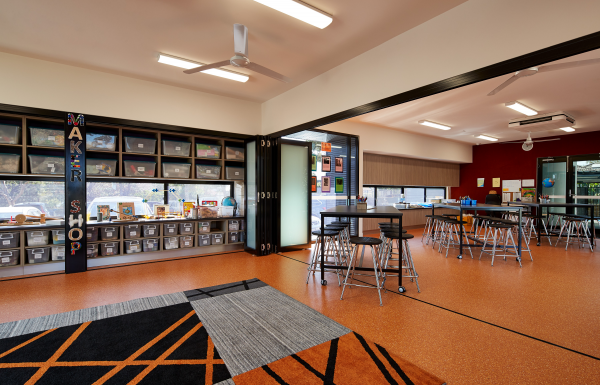 This modernisation provides opportunity for the school to inhabit contemporary spaces and experience all they have to offer the modern classroom, including current ways of teaching and initiating current teacher-student interaction. The plans have been designed to be very open; all the doors can be opened and the spaces becomes one giant classroom when required. Not only can the building be opened internally, it is able to be opened outwards. 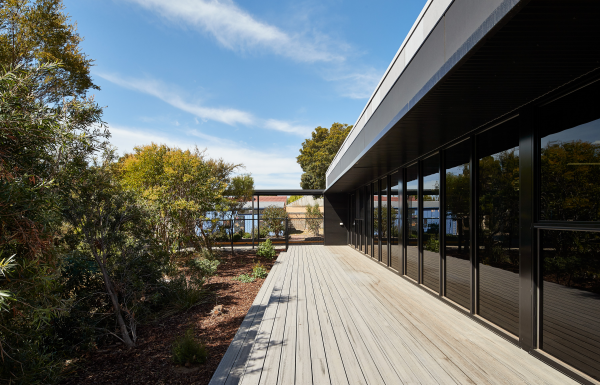 There are big outdoor decks, large areas of glazing and windows placed at a childs' height, to encourage students to interact more with the outdoors. Nature has also been designed into the building in various places, with one striking example being the orange splash of colour amid the blue floor. This represents the wetlands, which are located just outside that door and aims to bring awareness of the environment inside. The process k20 Architecture was involved in for this project was different from any other they had previously undertaken. Due to the nature of prefabricated construction, decisions throughout the design process had to be made quickly and accurately because there was no chance for changes to be implemented. Instead, the architects’ decisions would be communicated directly to the prefabrication factory where construction would be already underway. 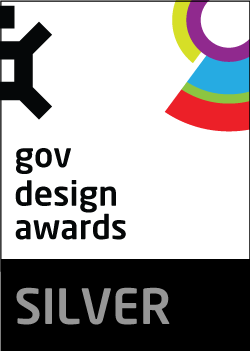 A further challenging aspect was working with the size limitations of modular buildings. Each part would be transported on a truck so they had to be designed accordingly. Consequently, modular buildings are generally rectangular in shape. To bring life to these otherwise regular spaces, lines were drawn between certain points and these were represented with the angles of the coloured carpet and reflected in the lighting plan. These angles were then utilised practically by applying various floor finishes which relate to the function of the relevant area. 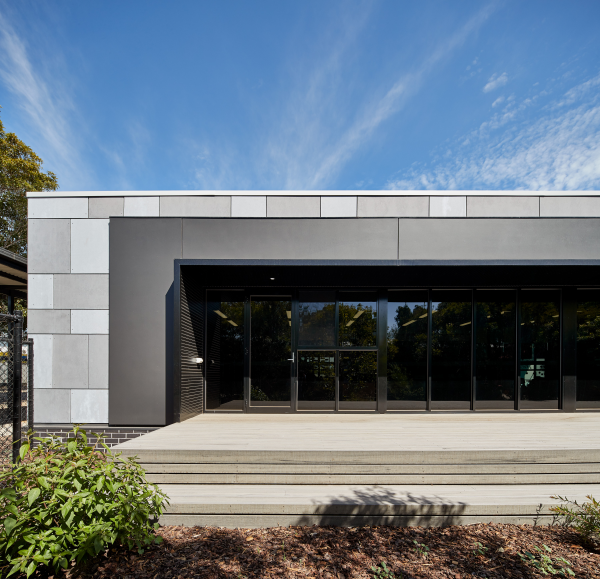 One of the significant design features of the buildings are the eaves which wrap the exterior walls, evoking a sense of layering and coverage. These were designed in conjunction with the large areas of double-glazing and the site orientation so the interior is naturally shaded, assisting in passive control of the indoor climate. 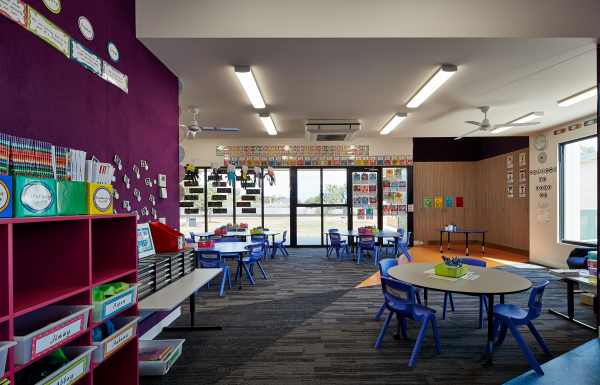 Materials were selected on their environmental merits such as; being recycled products, having low VOC’s (volatile organic compounds), providing longevity and durability, as well as being Australian and local products to reduce transportation miles. For example, the timber decking is Modwood which is a recycled composite material that was selected as it is hard-wearing and designed to deal with heavy traffic. 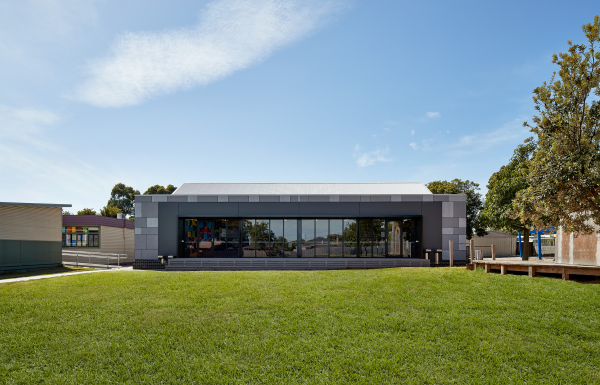 The structure itself only travelled for an hour from the factory to the site so it is a genuine Victorian school building.